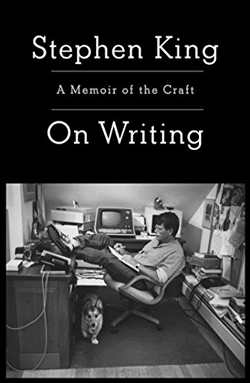 Stephen King wrote the book, On Writing, back in 1999. It is listed as an autobiography, but I like it more as it relates to writing. Which is at least part of the point. I like to read Stephen King’s books. Not necessarily all the horror ones, but I like his stories. One of my favorite books is The Stand. I remember reading it with Steely Dan’s Aja playing on my walkman. (Yes. It was a tape.) So I often get a shiver down my spine when I hear the music of Steely Dan. I like lots of Mr. King’s books including the Bachman books (The Running Man, especially) and The Dark Tower series. Yes, I know Mr. King is a pulp fiction guru who writes for the masses. His stuff may not be full of flowery prose and his stories may not resonate with beauty, but they are not meant to. They are reachable for people because the prose is easy and they are fun to read. Even if they may not have the most palatable subject matter all the time. Regardless of what people may think of his writing or his writing style, the man can sell books. And movies. One of the reasons that I read any of the Bachman books (where King wrote under the pen name of Richard Bachman) was because of the movie, Running Man. I never realized at the time that there were even such things as Bachman books let alone that Stephen King wrote them. So it was fun to read some different things by one of my favorite authors. I took to the book On Writing when I started writing in earnest. I liked the stories that Mr. King shared, but there was one lesson that has stuck with me to this day. The story needs to ring true. I take that piece of advice whether I am writing a piece of fiction or non-fiction. I doubt if anybody will ever compare me to their favorite authors or even that they would comment on my writing, but if they ever did, I would hope they said I write clearly and my stories sound true. I know there was much more to Stephen King’s book, On Writing, than that one tidbit, but those words of wisdom and his many examples have helped make me the writer that I am today. Of course, do not tell him that. I am sure he does not want to take the blame. Bubble Gum? The Bee Gees? Really?